Once upon a time Friedrich von Flotow was among the most popular opera composers, at least in the German speaking world. He was a contemporary of Verdi and Wagner – he actually died the same year as Wagner – and he composed around 40 stage works, most of them forgotten today. The only ones that can still be heard are Alessandro Stradella and the one under review, Martha. A search on Operabase gave the information that during the period 1 January 2017 and 31 December 2020 there are scheduled a total of 51 performances of 7 productions in 6 cities, all of them in German and Austria. This indicates that Flotow is not among the hottest names in today’s operatic world – but he is not forgotten. Truth to tell he may seem rather dated musically and the story in this particular work isn’t much to write home about. What cannot be denied is that he had a gift for good hummable melodies and his orchestration is professional, which can be heard in the overture, which once was a popular work on orchestral concerts. At a playing time of circa 8 minutes it is a perfect concert opener, and for the visitor to a performance of the opera – or for those who listen to a recording – it presents a smorgasbord of lovely melodies, wetting the appetite for what is to follow. The story takes place in Richmond, England in 1710. Lady Harriet Durham, a maid-of-honour to Queen Anne, is tired of Court life, and together with her confidante Nancy goes to the fair at Richmond, dressed as country girls. A lot of girls are hiring themselves out as maid-servants and Harriet and Nancy find themselves among these girls and suddenly find that they have been hired for a year by two young farmers, Plumkett and Lyonel. They can’t break the contract. The farmers soon fall in love with their servants, who prove to be totally inept for their tasks. Martha and Julia, as they call themselves, manage to escape through the window and the farmers are distressed at the loss, in particular Lyonel, who is deeply in love with Martha. In the third act Lyonel is walking in the forest where he meets a royal hunting party and recognises Lady Harriet. He declares his love to her but she rebuffs him and declares he is mad. Lady Harriet gives orders to send him to prison. However, Lyonel he is of noble birth, has a ring that he got from his father, and this ring could help him when in trouble, when sent to the Queen. Plumkett brings the ring to her and she recognises it and confirms that he is a nobleman. Lady Harriet is now willing to accept his courtship but Lyonel, having been unjustly treated, refuses to accept her love. To win him back Lady Harried and Nancy once again dress as country girls and return to the fair. When Lyonel sees Martha, he realises that he loves her and they agree to marry, as do Nancy and Plumkett. The story is rather operetta-like, but as opposed to “real” operetta there is no spoken dialogue. But the music has a lot of the easy-listening quality, which explains its popularity. In the early 20th century Martha was produced at the Metropolitan Opera in New York with Enrico Caruso singing the role of Lyonel – in Italian. Since then many great tenors have sung the aria Ach, so fromm as M’appari. It is still the number from the opera that is well-known, together with Martha’s Letzte Rose, which of course is not by Flotow but an Irish melody. It also functions as a kind of Leitmotif in the opera. Lyonel quotes it when he remembers Martha in the third act, before Ach, so fromm, the entr’acte before the last act is based on the same melody and in the finale Lady Harriet again sings it with the text Der Lenz ist gekommen. Lyonel has several good melodies, for instance in the duet with Plumkett in the first act (CD 1 tr. 7), and the quintet with chorus that concludes act III begins with Mag der Himmel Euch vergeben, sung by Lyonel to a melody that is very prominent in the overture, where it is played by a French horn. A song that once was a great favourite with resourceful basses and baritones, is Plumkett’s Porter Song, which opens act III. The present recording was made at live performances in October 2016. Oehms Classics have had a long and fruitful cooperation with the Frankfurt Opera and they have constantly produced sonically excellent recordings with great presence and realistic balance between stage and pit. The microphones even revealed some unsteady voices in the opening women’s chorus, but otherwise there are few blemishes. There is applause after some numbers, and one can also register some reactions from the audience at some amusing scenes, but all that only contributes to a sense of an uncommonly cosy evening in the theatre. Sebastian Weigle leads a generally speaking lively and brisk performance – there is nothing long-winded here – but the lyrical moments – and there are a lot of them too – are also well catered for. The enthusiasm of the conductor is also transferred to the singers, who act convincingly and seem deeply involved in the complications of the story. Lady Harriet, alias Martha, is excellently sung by Swedish-born Maria Bengtsson. Her tone is occasionally a little fluttery but technically she is up to the requirements, including some well-executed coloratura. Letzte Rose (CD 1 tr. 14) is intimately sung, as a folksong, which it is, and very beautifully. In the beginning of the last act she has a fine aria, Den Treuen zu versöhnen (CD 2 tr. 8), which is something to return to. 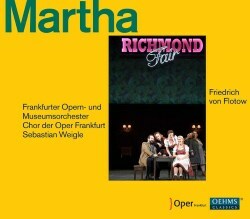 Katharina Magiera is a very good Nancy and she has a Jägerlied (Hunting Song) (CD 2 tr. 3) in act III, which is a little gem. Quite early in the first act the two ladies sing a beautiful duet, Teure Lady! (CD 1 tr. 3), which sounds like a German folksong, reminiscent of Humperdinck’s Hänsel und Gretel, but less Wagnerian. Lyonel and Plumkett, the two young farmers, are splendidly impersonated by AJ Glueckert and Björn Bürger. The former, American by birth and with previous appearances at the Metropolitan Opera and the San Francisco Opera, has an attractive lyrical tenor voice, well-produced and beautiful in the Fritz Wunderlich mould, and his solos, not least Ach, so fromm (CD 2 tr. 4), are true highlights. I hope to hear more from him. Bürger’s Porterlied (CD 2 tr. 1) is also a gem, and even set against Hermann Prey – my benchmark interpretation – he need not feel second best. The rest of the cast is also well up to the mark with Barnaby Rea’s expressive Lord Tristan and veteran Franz Mayer’s likewise expressive Judge of Richmond the most prominent. But the minor roles are also well taken, including the three maidservants hiring themselves out in the fair scene. The enthusiasm of the audience after the curtain-fall is enormous and this is understandable, since the whole production is infectious. Readers who contemplate acquiring a recording of this one-time favourite opera need look no further – if they accept applause (not too obtrusive) and the odd reaction of amusement from the audience. Competition isn’t very keen either. Veteran conductor Robert Heger made a classic recording of Martha in March 1968 with the Bayerisches Staatsorchester in Munich. He was 82 at the time and not as youthful and ardent as Sebastian Weigle, but he knew this repertoire, he was reliable in whatever he undertook and he had a dream cast of singers: Anneliese Rothenberger, a young Brigitte Fassbaender, Nicolai Gedda and Hermann Prey. That recording will never be redundant. Also in Munich, but with the Radio Orchestra, another reliable conductor led a cast of comparable excellence in 1977: Lucia Popp, Doris Soffel, Siegfried Jerusalem and Karl Ridderbusch. Unfortunately I haven’t heard that one. I will never separate from the Heger recording, but I am very happy to have Weigle’s set as a companion and I am sure I will play it just as often.